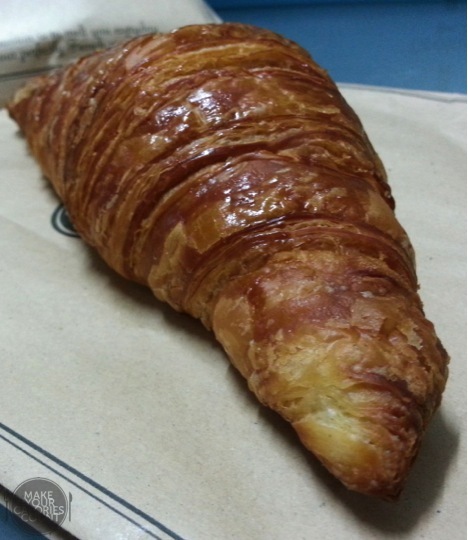 I was first captivated by the aroma of the bakery at its first shop along Telok Ayer, and being the crossiant lover, it made me determined to go back for a taste of their pastries. A traditional French bakery and of course, seeing how the trays got swept clean at its Telok Ayer branch, it got my expectations up. Passing by its latest branch at Wisma basement, I thought I just had to give it a try! It's always tough trying to satisfy my taste buds with crossiants cos I'd either pick on it for being overly flaky, too hard, not fluffy enough or lacking the buttery aroma. 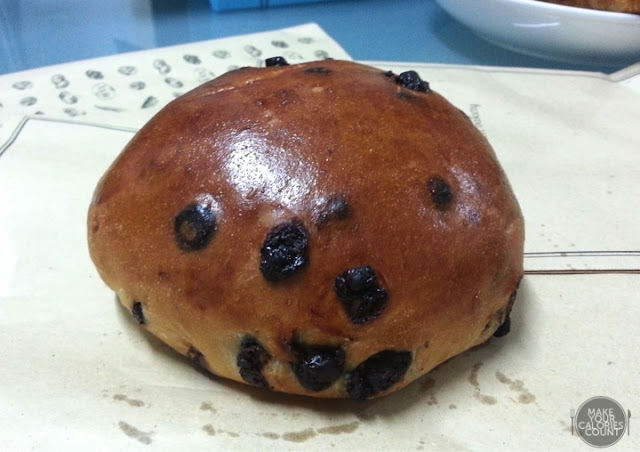 I've tried the one at Tiong Bahru Bakery, claimed by some to be the best in town, but it just wasn't to my palate. This simple looking pastry took me by surprise as I took a bite of it and was greeted by the soft folds on the inside and a slight crisp at the side of the crossiant. There was a light buttery aroma yet no signs of it being too oily. I liked how it was soft and fluffy inside and the buttery flavour lingered for a while inside your mouth. 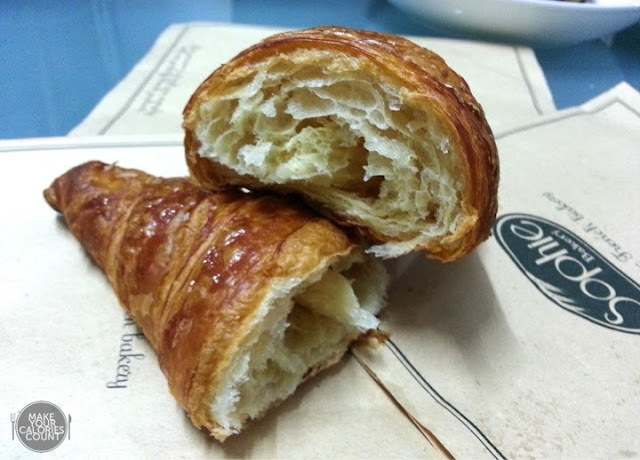 I know of friends who're fans of the flaky version of this pastry and this wouldn't be your type of crossiant if you're looking for that crunch or crispy flakes stuck to the sides of your mouth. A soft and simple version, I was satisfied with this plain old crossiant. Of course, I didn't have it fresh from the oven, so perhaps it could have been even better with slightly crispier crust for that perfect touch! Hidden inside this glazed brown shell, is a patch of dalmatian-looking bread filled with soft chocolate that got us excited with the pretty sight of it. 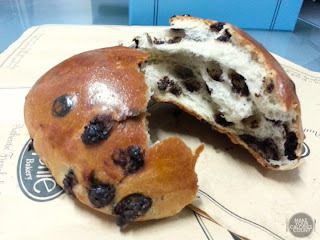 An ordinary bun whose status just got elevated with those lovely dots of chocolate, it's perfect for choco-lovers! It was a tad too sweet for my liking, but I liked the fact that it wasn't the cheapo kind of chocolate used. Fluffy bread on the inside, it complemented the dense-ness of the chocolate well, to bring out chocolate chips as the highlight of it. Used to those with a crispy skin and soft fluffy insides that tend to leave crusts all over my mouth, I wasn't quite sold by this stiff-looking bread. 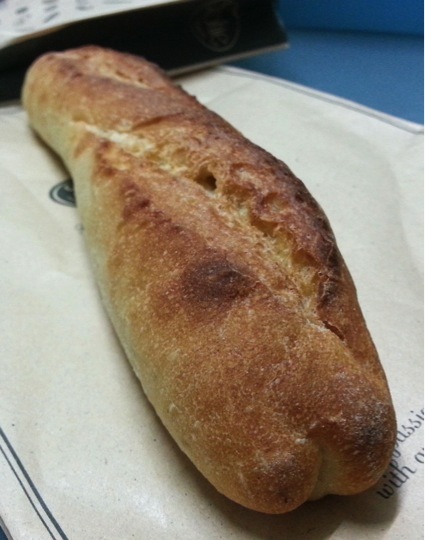 Compared to the great rendition we've had from Maison Kayser, I would probably call this a down-to-earth version. It didn't have the crispy outsides, nor the airy fluffy insides, but instead it was quite a solid composition of fine bread, that was simple yet addictive. The kind to go well with your simple butter and jam, and best if you have it warm. I shall share my official favourite place to have cookies but please leave some for me and not buy it all hor! If you love cookies the home-baked style (instead of the gritty type that Famous Amos has), you'd love this! With fine grains and a subtle flavour of butter cookies, it tasted just like what you'd get from those who bake at home. Finely mixed and crispy throughout, I loved how there was so much cranberries in the mix that you could taste it in every mouthful! A fan of hard cookies, buttered kinds and cranberries, this was the perfect one for me! 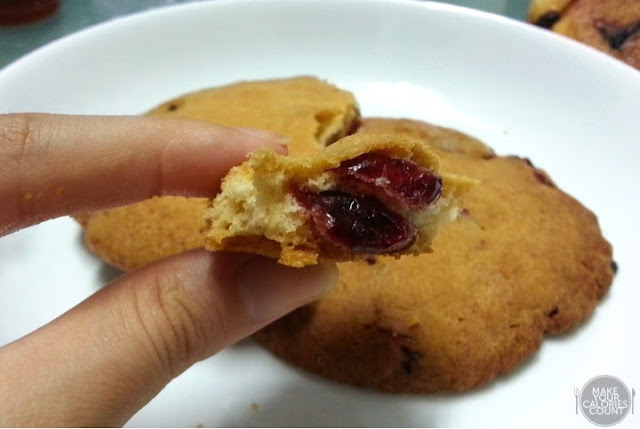 A simple cookie that tastes of home, and with all my favourites in it, this would be top on my list from now on. 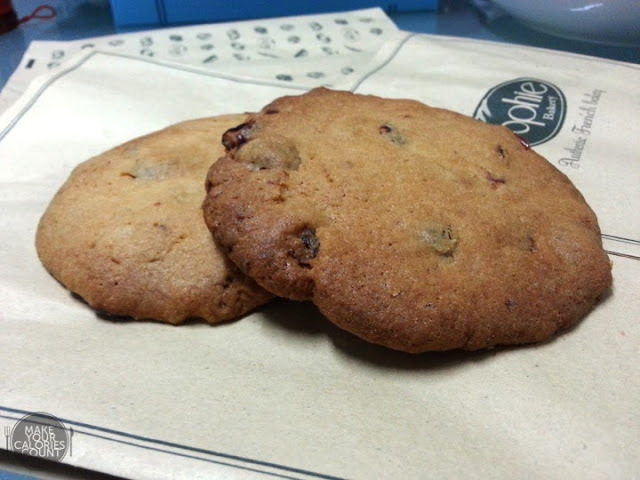 Not too sure if it was the timing or outlet though, my friend who went over to Novena Square's branch at night was pretty disappointed by the cookies, having lost the crispiness of it and tasted like 'lau hong' cookies. Nonetheless, I'll be back for more very soon and probably my staple every time I pass by Wisma! I went in with skeptical taste buds, thinking that it would probably be another one of those over-hyped bakeries but came out with simple pastries that left me very satisfied. It won't be fireworks with every mouthful, just simple pleasures with good ingredients and value-for-money. Definitely a place that I'll return for more!